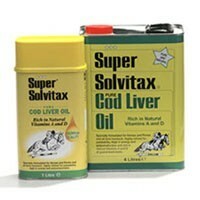 Super Solvitax Pure Cod Liver Oil is a highly palatable and rich source of slow burning natural energy for added stamina. Containing vitamins A, D and E, Cod Liver Oil help ensure your horse has a healthy coat, bright eyes, firm bones and strong teeth. The oil increases palatability and reduces dustiness in feeds, helping to eliminate respiratory problems. Excellent item - just what I need for adding to my rubby-dubby (attractor) when I'm pike fishing. Quickly received too!